Wado-ryu is a Karate style founded by Hironori Otsuka Sensei in 1934. Wado-ryu means Style of the Way to Harmony (or Peace). Karate (空手, empty hand) is a discipline of Budō (武道, The Way to Martial Arts), the complex of the Japanese combat systems. Karate originally developed in Okinawa, a small island located between Japan and southern China, centuries before falling under the rule of the Japanese empire. Thanks to the constant trade relations and cultural exchanges with China, the warriors from Okinawa learned Kung Fu (功夫, personal ability), in particular the Hequan style (鹤拳, crane boxing), and merged it with the ancient Okinawan traditional combat styles (Kobudo), thus giving birth to Karate, which – like Kung Fu – was practiced by different schools with a different style. Wado (和道, Way to Peace/Harmony) is one of the most recent styles and is the natural evolution of karate, after being introduced in Japan at the beginning of last century. The founder of the style, Hironori Otsuka, already Grand Master of Shindo Yoshin-ryu, an ancient Jujutsu style (the Japanese martial art Judo and Aikido originate from), was impressed by Okinawa’s karate. Otsuka observed that karate used techniques that Jujutsu did not, and viceversa. So, in 1922, he started studying it with the idea to merge both technical methods and to apply the principles of Jujutsu to Karate. Wado-ryu is the result of that merging. Wado-ryu is the result of the application of Jujutsu Kempo principles to Tou-di in Okinawa (the original Karate) and this makes it a style per se. Positions are natural and its smooth techniques privilege the skilful use of taisabaki (body movements). Hironori Otsuka taught that our movement is the manifestation of our spirit. The principles and techniques deriving from Shindo Yoshin-ryu Jujutsu envisage the in-depth study of projection techniques (nage-waza), twisting of joints (kansetsu waza), holding and choking (shime waza), and atemi waza (blow techniques) are a typical complement in Karate. Moreover, Otsuka replaced the classical pattern attack-block-counterattack with attack-counterattack. He preferred avoiding (nagashi) and dodging to countering. In Kihon Kumite, which can actually be defined as the summa of the principles of Wado, we find the very particular dynamic concept characterized by dodging-counterattacking-unbalancing (or throwing) in one technical gesture. The name Wado-ryu is composed of three different ideograms (kanji, in Japanese). The first kanji, Wa (和), like it often happens with Japanese ideograms, has several meanings and facets. Wa is used to indicate the summa – harmony and peace – but it also represents everything that is Japanese. Kanji Do (道) literally means way, path or pathway but in a more spiritual sense. Do (道) is also way, manner, life style. Kanji Ryu (流) means style or school. The name Wado-ryu derives from the motto Ten Chi Jin no Ri-do ni Wa Suru. Ten means sky, Chi means earth, Jin means human being, Ri-do means reason, truth and Wa puts together all these concepts, namely the harmony of all these elements. The phrase can be translated as follows: Harmony can be reached only by researching into the inner reason of the sky (spiritual and intellectual sphere), of the earth (material, body and practical sphere) and of the human being (heart, courage, love). This way, the term Wado suggests that to train the body on its own is not enough like in sports, in the same way to train the mind and the spirit on their own is not enough, like in the study and meditation, in order to be able to realize our potential. Wado-ryu aims at pursuing the way to harmony by training the body, the mind and the spirit, by fostering and cultivating a healthy, ethical and profitable life style for oneself and the others. In Wado-ryu the martial arts are seen as a process of growth and human enhancement in the largest way as possible, in the wave of the true spirit of Japanese Budō. Hironori Otsuka was born in the city of Shimodate, Ibaraki prefecture, Japan, on 1st of June 1892. The son of a doctor, Tokujiro Otsuka, he started practicing Jujutsu under the guide of his great-uncle, the samurai Chojiro Ebashi as a five-year-old child, while as a 13-year old teen, Hironori became a student of Shinzabuto Nakayama, an influential master of Shindō Yoshin-ryu. On 1st of June 1921, on the day of his 29th birthday, he was awarded Menkyo Kaiden – the highest certification of mastery in Japanese Budō – in Shindō Yoshin-ryu jujutsu directly from the Grand Master Nakayama Tatsusaburo. Less than a year later, Hironori met Gichin Funakoshi, founder of Shotokan Karate and decided to learn also the martial art from Okinawa. He shortly became Funakoshi’s assistant and remained with him until 1934, when he parted from him to found his own school where Shindō Yoshin-ryu merged with Jujutsu Kenpo: Wado-ryu Karatedō. This progressed to the point that it became the most wide-spread style in Japan. On 29th of April 1966, Hironori was awarded by Emperor Hirohito with the Cross of the Order of the Rising Sun (Kyokujitsu-sho) for his contribution to the development of Karate and in 1972, the International Martial Arts Federation (Kokusai Budō) awarded him the title of Shodai karate-dō Meijin Judan (Karate Master 10th DAN of First Generation). It was the first time that this honour was reserved to a Karate master. He continued to train and teach until the day of his death on 29th of January 1982, at the age of 89. What's the difference with other styles? Thanks to the influence of jujutsu the Wado is focused on the principle of softness (ju): while other styles try to stop the opponent’s blows arresting his energy, the wadoka uses the opponent’s strength to his own advantage. Furthermore, a wadoka expresses power through speed and precision, eliminating unnecessary movements (mudana dosa). This style develops elasticity, speed and ability, minimizing the use of brute force in favor of a real dynamic intelligence. When can the children begin? There is no strictly established age, because it varies from child to child. Usually, around the age of six it is possible to have a soft karate start, while around 9/10 years we can have a deeper martial start. What about adults in old age? You can start practicing at any age, even without previous experience. Wado-ryu is a soft, fluid and progressive style that favors the body’s natural stances and movements. Therefore it is highly recommended in all seasons of life and for people with the most disparate conditions. Is it true that it can be therapeutic? Yes, and it is proven by scientific studies. Wado-ryu is therapeutic for hyperactive children and for the ones having behavioral disorders. According to a 2007 American study published on the International Journal of Offender Therapy, children practicing Wado-ryu have a significant improvement in intensity and adaptability of their emotional states, and they also improve the ability to regulate them. Therefore it can be a valuable therapeutic resource during the age of development and adolescence for behavioral disorders, aggression, Attention Deficit Hyperactivity Disorder (ADHD), autism, social phobia and anxious-depressive syndromes . What are the benefits for adults? Naturalness and fluidity of its techniques make the Wado a valid fitness tool in adulthood, developing joint mobility, flexibility and muscle reactivity, improving reaction times and practically all ability’s levels. It is also a powerful mind training, for the benefit of attention. All elements very useful in daily life (such as, for example, when driving). Furthermore, by practicing barefoot, the plantar pump is strengthened, to the advantage of the cardiovascular system, and the natural approach to stances offers, actually, similar results to postural gymnastics. All this, by learning a martial art. Is it a dangerous activity? No, far from it. In fact, it is one of the safest disciplines for both children and adults. The attention that is placed in each activity, the increasing joint mobility, motor ability, balance, concentration and self-mastery make it an ideal sport and martial art for everyone. Is it a good self-defence system? Okinawa’s karate was born as a combat system and self defense. Japanese jujustu was the martial art core training of samurai warriors. Wado-ryu comes from karate and jujutsu, so the right answer is yes. The traditional Wado-ryu focus on the techniques’ effectiveness and the progressive and constant training of body and mind to enhance individual responsiveness in every circumstance of life. Does it help to stop bullying? Yes, and not only for the benefit of those who are the victims. Traditional karate strengthens children in body and spirit, infusing them with greater awareness and self-confidence and thanks to the adoption of the Budō traditions – steeped in Zen spirit and discipline – it is particularly effective in harmonizing relationships. Practitioners wear the dogi, a white cotton uniform that symbolizes the purity to which they tend and the irrelevance of socio-economic differences. The colors of the belts reward each other’s commitment and gradually assign more responsibility. The ritual greetings to the dojo and the companions train the boys to respect the common places and the people they interact with. The ritual cleansing of the tatami teaches to take care of the spaces in which one lives. The discipline that regulates every training favors a silent and collaborative environment, in which learning and improving becomes a shared goal. 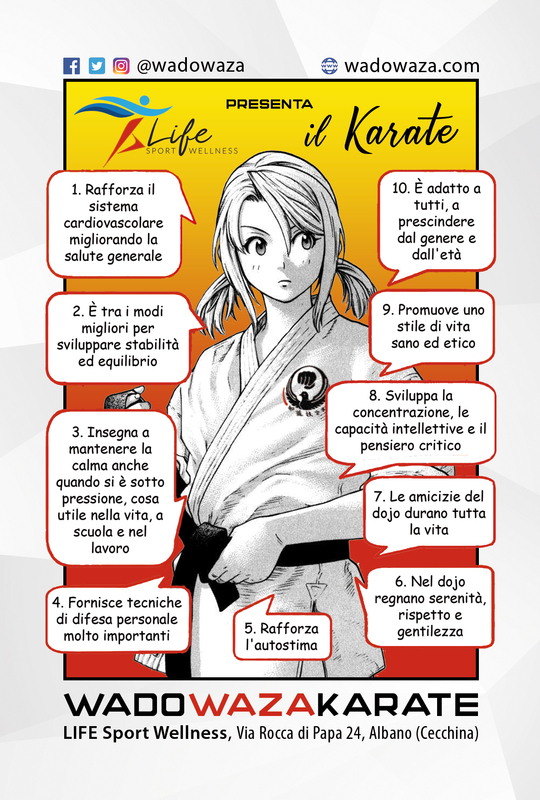 In addition, scientific studies have shown that traditional karate reduces the level of aggressiveness in children, making them more self-confident and more likely to intervene in aid of others (read this article). In a context like this it is possible to counter the phenomenon of bullying by providing the victim with the tools to break the victim-executioner dynamic without demonizing the “executioner”, who usually, let us remember, is still a child. In the dojo we activate targeted programs that include both the emancipation and redemption of those who are bullied and the recovery and evolution of those who puts it in place that hateful behavior. Is it good for disabled people? Yes. Karate can enormously benefit people with disabilities. The WKSI – the association to which the Wado Waza dojo adheres – through the permanent project Abili al Karate, has long welcomed in its dojo people with all kinds of disabilities, physical or mental. We are members of the international IKF – IKKAIDO, an association for sports and the inclusive martial arts and we participate in some European projects (European Inclusive Deportation, PRIME – Participation, Recreation and Inclusion through Martial Arts Education, Erasmus +) which aim to develop adapted teaching methods aimed at the most complete and harmonious inclusion of people with disabilities. Matter on which the WKSI is at the forefront.